Below are testimonials from my own patients who have had vitrectomy for floaters or “FOV.” I’ve set up this page as a convenient (easy) way to leave a testimonial about their experiences and a place where you may ask questions. I’ll monitor and answer if appropriate. In this digital age, your observations, remarks, comments about your experience with me, your experience with vitrectomy/FOV are valuable for those who will arrive to this site after you. Your opinions are valuable to other patients. 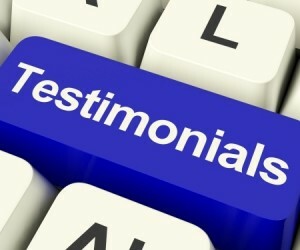 Thank you for taking the time to leave a comment or review about your experience. Use this space to leave suggestions on how I may improve the process for you and other patients. If you are kind enough to leave a comment, please note that they will NOT BE PUBLISHED immediately. Unfortunately, due to the huge amounts of “comment spam” (bogus comments left on a website in hopes of generating traffic to another site…or worse, hackers trying to access this site), each comment or testimonial must be approved manually. All I can say is THANK YOU!!!!!!!!!!! I am reporting back to you as asked and promised that I completed my 10 day follow up today with my local retina specialist here in Nashville, TN. My vision in my operated eye is 20/30 which is exactly the same as prior to my FOV. My pressure is 11 which I’m told is 100% normal… it was 14 last checked by you. Most importantly, my retina is fine. The floaters are G O N E!!!!!!!!!!!!!!!!!!!!! Simply no longer. All of them. I was anticipating a good result Randy, but was managing my expectations. You delivered all that and more. I know results will vary, but my vision has simply never been so crisp. The numeric 20/30 “grade” does not in any way speak to the truly drastic improvement / clarity in my vision now that the floaters are gone. I went for a mountain bike bike ride yesterday on a bolt blue sunny day and just marveled at the acuity. Your professional skills have been a game changer for me. So many years of toleration, frustration, two laser procedure attempts… both useless… and finally a 100% remedy. As continued follow up, I will continue my two eye drop regimen as directed. If there is anything else you’d like from me as your patient, just ask and I will comply. So glad you are doing well. Thanks for keeping in touch and taking the time to share with others. I would like to share my FOV experience with you in the hope that it aids you in making your difficult decision. I first noticed floaters in my vision in my early teens – at that point it was a manageable problem. As time passed the problem got worse and worse – it got so bad that I didn’t feel completely comfortable driving anymore. I had to do something about it and luckily I found Dr. Wong. I had FOVs done over the summer of 2014. I am now 10 months post-op and cataract free. I am pleased with the results of the surgery – I can flick my eyes back and forth like I could only imagine before the surgery. If floaters are severely reducing your quality of life then I would recommend getting FOV. Glad you have done so well. Thank you very much for sharing your experiences with others. In February 2015, I decided to give myself a rather unusual birthday present: a vitrectomy to relieve my right eye from constant prominent floaters in my field of vision. I also have some in my left eye but they out in my peripheral vision. I did not undertake this operation lightly. In fact, I had an alternative procedure done five separate times with a laser (vitriolosis?) but with limited success. For those of you who have investigated this procedure, it depends heavily on you being able to direct the doctor to see the floater you actually are seeing; many times you and the doctor are seeing different floaters so the success rate can vary greatly. The vitrectomy Dr. Wong performed removed as much of the vitreous as possible and replaced it with saline solution. Yes, there can be complications, such as cataracts forming more quickly, but I have had the start of cataracts in both eyes, so that wasn’t an issue. The actual operation lasted about 15 minutes, there was hardly even any mild discomfort after a day or two and I had a significant improvement in vision. I know I’ m only a few months out but the difference is remarkable. I would unquestionably recommend Dr. Wong for issues involving floaters. After being annoyed and suffering for over 40 years with floaters, what a gift of improved sight he has given me. I might also add that he has a very interactive website with webinars and answers to questions. I enjoyed his webinars, taped from previous live interactions with patients on the computer in real time. I highly recommend a thorough review of his website before proceeding. Dr. Wong is an extremely professional, competent and affable person who really cares and takes the time to explain to you all the ramifications of the procedure. I thank him immensely for what he’s done for me. I live in MA as well. Would you mind private messaging me about your experience? Thanks for your testimonial. I am also from Massachusetts, so can you tell me – after Dr. Wong did the FOV vitrectomy, did you have another, local doctor for regular checks? If the vitrectomy leads to a retinal tear, one needs to get to a doctor quickly, I believe. Thanks in advance. We are hosting another webinar tomorrow night, 1/31/17. Here’s the link if you are interested. HIGHLY RECOMMEND DR. WONG FOR A FOV PROCEDURE .THIS WILL ELIMINATE ALL OF YOUR FLOATERS! PROCEDURE DONE AND THE RESULT WAS CERTAINLY WORTH THE TRIP. Thank you and congrats! Glad you are so happy. Thank you also for taking the time to share with others. In todays world I feel the medical profession can be quite arrogant and complacent. All the Ophthalmologists I’ve seen said “get use to it “or “floaters are your friends”. Yes floaters are benign but they can be very obstructive to your vision. Vitreous opacities or floaters should be thought of as cataracts of the vitreous and treated as cataracts are. To me they are worse because they move and have different values of opaqueness which make them very annoying and driving at night was boardering on dangerous . Randy is a pioneer in advocating change in the stigma against people with severe floaters. It’s been almost three weeks since my surgery in my left eye and all I can say is, MY VISION THANKS YOU! Thanks so much for sharing your experience and views with everyone. I am so sorry, but I do not know any surgeons in Germany though there are many great retinal surgeons there. Our next webinar is this Monday 10/30. Register here. I am a 23yo F considering FOV. I was born with retinopathy due to prematurity and me retina was detached when I was born. They were able to fix it and fast forward. I started seeing floaters when I was 12, and it was always told it something you just learn to live with. I developed cataracts when I was 14 which they say was also due to my prematurity. I got cataract surgery on my lt eye when I was 15 and rt eye when I was 17. Now I am looking into the FOV because I was told now I have options which peaked my interest. The floaters are mainly a concern with work and the bright computer they blend in wifh the letters at times and I ger HAs, and outside or any bright space really just trying to look past them. I would just like to know if there would be any differences or other risks given my hx since from what I have read so far the most common effects they are concerned about is retinal detachment and developing cataracts and I have had both. I also read they have two ways of doing it one the normal way which takes 2 to 3 hours and they have a sutureless way that takes about 30 min, but I am assuming that wont be an option in my case? Thank you for reading this, I look forward to your response. Kind Regards. Sorry for the extreme delay…my fault. I usually perform vitrectomy using 25 gauge instruments. In my opinion, much safer and more efficient the previous systems. Either could work with you. It is unusual for macular pucker to develop after a vitrectomy but I have heard of it on occasion. Hello, I have been looking at your site for a while, I congratulate you, thinking about the psychology of the patient, because it is a real test of these floating bodies, I had a detachment of retina to the left eye that was treated quickly. But I have floating bodies that displease me. Hope you are well. I apologize for the extreme delay in responding. Could you re-send your question? I don’t quite understand. I am sorry for your troubles. I don’t know how I can help you in Pakistan. You should learn more about vitrectomy – in my opinion, it is not as dangerous as you state. can floater ride with time and can use multivitamin help full for ride to floater?? I think it’s quite possible that a floater disappears with time. I am not aware that multivitamins would be helpful. thankyou so much for answer i have seen your many surgery’s godblass you best of luck i wish like you some one great surgeon in my country. My name is Jalil and I had vitreous detachment that cause immense amount of floaters on my eyes and I was thinking about FOV to remove them and have clear vision as I use before ! My questions Dr Randall Wong is Do you know any good Dr Specialist in Ma ? also is the prescription change after the POV ? Thank You Dr Randall Wong. Do you mean Maine? Not familiar with any. So sorry. I am curious about the typical price for a surgery like this? Do insurance companies tend to cover this type of surgery? I apologize for the long delay. Somehow I missed this. Do most patients opt for sedation? Is it recommend? Can anyone share experiences? Over 90% opt for sedation. Not an issue. Hello. My name is Markus from sweden. I have recently gotten a floater in my right eye. From what I can Google it is a Weiss ring directly fixed in my line of vision. My question is if Weiss rings that are fixed are easier or harder to treat and also I would like to ask what the price is for an operation? The doctors I’ve seen here say I will get used to it but I really can’t see how since I can’t focus my right eye causing me headaches and sometimes nausea. …. I have a question I am legally blind in my one eye I was born with this so very low vision that is not correctable with any surgery . Would I still be a candidate for my right eye since the floaters in my left eye don’t bother me due to the legal blindness ? As long as my eye is healthy would most doctors still complete this surgery ? So sorry for the long delay, I lost this question.